Corrugated paper borders in fun colors! Ready to use and perfectly sized. Ideal for bulletin boards, window or desk trim. Craft projects and so much more! Each colorful roll measures 2-1/4"W x 50'L. Corrugated paper borders in bright, fun colors. Ready to use and a perfect size for bulletin boards, window or desk trim, craft projects and many more decoration ideas. 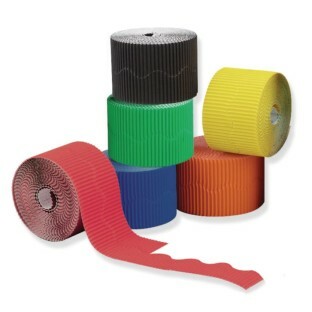 Each colorful roll measures 2-1/4"W x 50'L. Assorted colors. Pack of 6. Sorry, no color choice. Helps our bulletin board look professional and fun ! Easy to use. no sharp edges so if a resident touches or grabs it- no worries ! The boarders are together with perforated edges that you need to pull apart. This is a little hard to do and sometimes you end up with torn edges. We use this product for our bulletin boards at an after school program.